Sometimes parents can't have too many ideas at their fingertips. I share all of my recipes on my blog here, but when another parent shares battle tested kid-friendly recipes, you must listen. After all, if one source isn't right for your family, it might help to try another. This is where Anna Adden's book Happy Bento comes in. Anna Adden has spent a number of years writing the creative food blog becomingabentoholic.com. This means one thing. She knows what she's talking about. Her new book is filled with her vast experience making bento lunches for her own kids. When you peruse the pages you find every category of bento that you can think of. If you are a beginner, there is a section for you. If you want to make fun cartoon characters, those are included as well. Holidays, Seasons, ideas for shopping, lunchbox choices, they are all in there. The book also contains helpful pictures that not only show you the finished product, but many step-by-step pictures too. 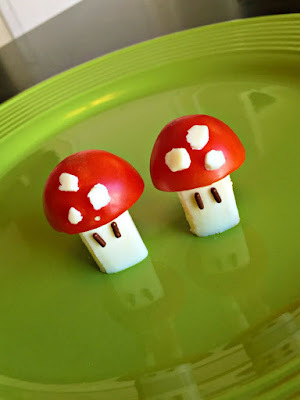 is for making the mushrooms from the video game Super Mario Bros. I won't tell you exactly how she says to do it, but it is so easy I am kicking myself for not thinking of it first! I especially enjoyed the beginning section that goes into detail about helpful bento tools. When you know a few basic techniques, and have some of these tools on hand, it saves a lot of time and frustration. We all know that parents need more time and less frustration in their lives. If you are looking for fun lunch ideas for back to school time, you will want to check out Happy Bento (after you exhaust all the ideas on my blog of course). 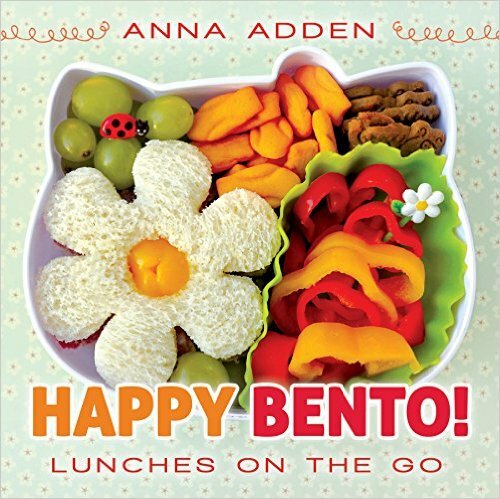 Happy Bento is available now on Amazon.com. Disclosure: I was given a copy of this book for review but received no compensation. All opinions expressed are my own.